Traverse the mountains and lakes of New Zealand's South Island on this exciting self drive family tour. Beginning in Christchurch, head south to the adventure capital of Queenstown - along the way enjoy a variety of family friendly activities including nature encounters, a tour of the Cadbury chocolate factory and some fast-paced action at the Skyline Luge! 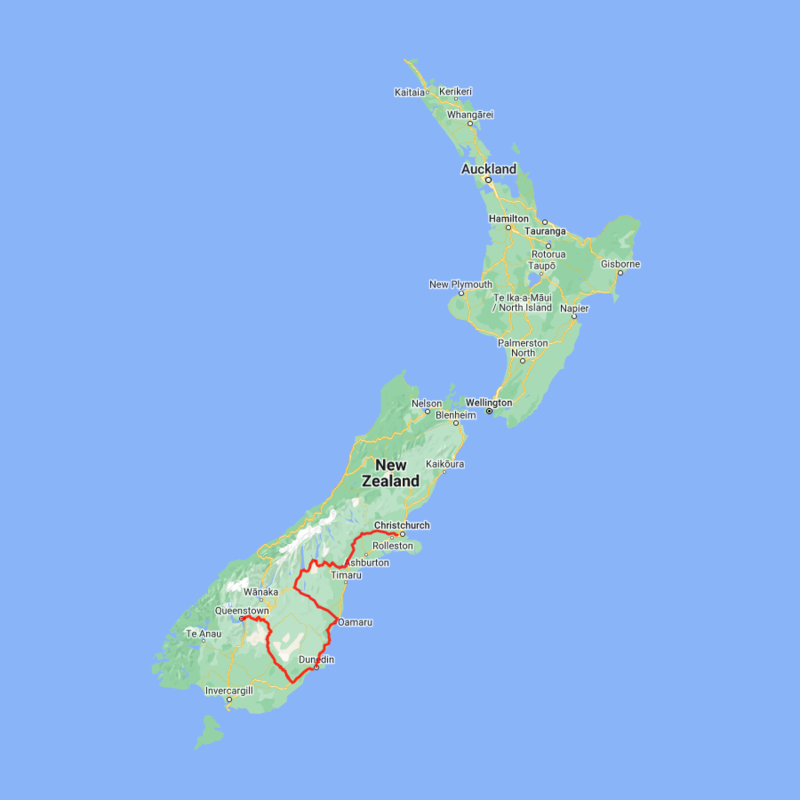 You can expect to spend around NZ$121 in fuel cost on this itinerary based on an intermediate sized car. Today you head into the heart of the South Island. Crossing the vast Canterbury Plains along the inland scenic route the first township of Geraldine offers an ideal refreshment stop before you head into Mackenzie country. Passing through places such as Beautiful Valley it's not hard to understand where the names originate. Ascending Burkes Pass and onto the high country plateau and the picturesque town of Lake Tekapo, the first of the large Southern Lakes. It's a great place to take a scenic flight, enjoy a guided horse trek, a boat trip on the pristine lake or just enjoy the magnificent views. Lake Pukaki is just another 30 minutes drive from Lake Tekapo and you are often rewarded with spectacular views the full length of the lake and into Mt. Cook National Park. At 3754 metres, Aoraki Mt. Cook is New Zealand highest mountain and the peak can often be seen from the visitor centre at the southern end of Lake Pukaki. It is just a quick 30 minute drive from the main road into Mt Cook Village itself (allow a couple of hours though to drive both ways and spend a little while here). Mt. Cook National Park offers the visitor a huge range of activities. Mt. Cook Ski Planes operate scenic flights that include a unique ski landing on a glacier. At around 15 kilometres long the Tasman Glacier is New Zealand's longest and a glacier explorers tour will show you these unique features. There are many short hikes in and around the park and these are well marked and there is something for almost every ability. Twizel, just south of Mt. Cook was the location of many Lord of the Rings movie scenes and a little further on is Omarama, the gliding capital of New Zealand. Wrinkly Rams is a local café and also offers an informative sheep shearing demonstration. Heading down the Waitaki valley you follow the hydro power generating system towards the east coast. The town of Oamaru is most famous for its buildings constructed with the unique locally quarried white stone. Explore the old quarter or if you don't mind a late arrival into Dunedin then stay around to see the blue penguins come ashore at dusk. Further south the Moeraki Boulders are a unique geological feature and worth the short detour to the beach to view. Arriving into Dunedin you can appreciate the city's Edwardian and Scottish heritage through its fine buildings particularly around the Octagon and city centre. Discover rare objects, special exhibitions and a live butterfly rainforest experience at the Otago Museum. Through the galleries you'll discover the unique culture, heritage and wildlife of the Otago region. Highlights include the Tangata Whenua gallery which tells the story of the Southern Maori life and mythology. The Discovery World Tropical Forest is fun for young and old, you'll enter a rainforest filled with hundreds of beautiful butterflies. The special exhibitions are always fascinating and when you're ready for a break there's a great cafe to relax at. The museum is open 10am to 5pm daily, except Christmas Day. For information on current exhibitions and admission fees for exhibitions and the Discovery World Tropical Forest visit the Otago Museum. Encounter history at the Toitū Otago Settlers Museum. Learn about the people whose character, culture, technology, art, fashion, and transport shaped New Zealand's First Great City - Dunedin. In the galleries you can trace the fascinating journeys from the earliest settlers, Kai Tahu and their ancestors, to the most recent arrivals. The themed galleries weave the stories of past and present with future thinking, featuring interactive displays with stunning visuals and powerful narratives. Admission is free and the museum is open daily (except Christmas Day) from 10am to 4pm April to September, 10am to 5pm October to March and Thursdays until 8pm. For more information visit the Toitū Otago Settlers Museum website.